The ability to trace ones’ roots often opens new and hidden avenues to help explain who and what we are or what we stand for. This handbook would not be complete without touching on our past and looking toward the future of error collecting. Please journey with us as we take a moment to view CONECA’s history. Late in 1956, a small group of mint error collectors decided to band together and form an organization. The ANA convention was the focus for 30 members joining up. The officers of the first error club were: Michael Kolman, Jr., President; and Raymond Larson as Secretary-Treasurer. COME, Collectors of Mint Errors, was off and running. In October, 1956, the club issued its first bulletin, the Mint Error Bulletin. Within its first year, well over 100 members were signed up and the publication grew to over 10 pages. Mint errors gained rapidly in popularity. Many error collectors began to put displays together for show competition. Quite a few 1st, 2nd, and 3rd place awards were won. Mint errors began to be offered in auction catalogs as interest grew. The first few years saw rapid growth in research and knowledge. In the early sixties, the decision was made to change the heading at the top of the bulletin which was a lamp of knowledge with a wreath and two gold errors. Within the lamp were the words “knowledge” and “integrity.” Beneath the logo were the words “may the light grow brighter as time goes on.” We will see that some of these words continued to be a part of the club as it evolved into its present day form. Much like a company or even a country changes with age/growth, so we saw a change in the error collecting community. Around 1963, two major forces emerged, each heading in a direction it felt most beneficial to the errorists. As best as can be remembered by those we surveyed who are still “active” within the hobby, the following information regarding the growth and development of the two major error clubs follows. CONE, Collectors of Numismatic Errors, was founded in 1963, with Al Maynard, Harry Parshall, and Jack Sams as prime movers. The club was organized with one thought in mind. The club’s motto, “Sharing Knowledge,” caused the club to emerge as a leader of establishing methods of collecting mint errors, establishing definitions, doing research on the way coins were normally minted to find how the error occurred, etc. The club publication, the Errorgram, originally was a column appearing in a Dresden, Ohio newspaper, the Post Transcript. CONE appeared to place a higher priority in the education and collecting of minor mint errors and varieties. John Wexler and Robert Wilharm were responsible in developing an 8 1/2″ x 5 1/2″ high quality format in later years, and the services the club offered are still with CONECA today. CONE evolved into a national club with mid-west and eastern dominance. The club offered a lending library, computer logged error coin listings for doubled mint marks and doubled dies were for sale, and many fine research books were offered by the authors. Two of the most noteworthy authors who were member/officers of CONE are Alan Herbert (deceased) and John Wexler. Alan wrote The Official Guide to Mint Errors, and John is noted for his fine works on doubled dies. To date, John’s best work to date has been The Lincoln Cent Doubled Die. NECA, Numismatic Error Collectors of America, was started by Mort Goodman, Arnold Margolis, Emil Di Bella, Joe Bush, Estelle Stewart, Jim Johnson, Syd Kass, to name a few. The club, NECA, started around the same time as CONE. Generally the purpose of this club was the same, although the interest seemed to be more into major type errors rather than the minor die varieties/errors. The monthly publication, the Errorscope, was an 8 1/2″ x 11″ mimeographed format. It later evolved into a high quality 5 1/2″ x 8 1/2″ format, similar to CONE’s, and was printed by Lonesome John. NECA evolved into a west coast club, dominated by southern California members. It was here that many of the local error clubs, very active from the late 60’s to the early 70’s, got started. In southern California alone, three local clubs were formed and monthly meetings, displays, and error coin auctions held. It was not unusual for a number of individuals to be members of all three clubs, many of them driving up to 100 miles one way to attend the meetings. It was during the surge of interest that the annual “Errorama” show was conceived and held. Southern California had the members and the interest. In 1967, the first specialized error coin show was held in Hollywood, CA. 1968 saw the “Errorama” return to its first location at the Hollywood Roosevelt Hotel. In 1969, EAR moved to Anaheim, CA, and was sponsored by the local Orange County Numismatic Error Collectors, OCNEC. The first two EAR’s were sponsored by ECOH, the local Error Club of Hollywood. The following year, Errorama moved back to Los Angeles county, and was held in Studio City, California at the Sportsmen’s Lodge. This show was sponsored by Duane Spellman and Lonesome John”. 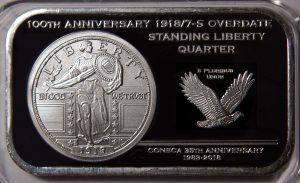 In my thoughts, this was the best ever specialized coin show, bar none to date. The things that topped this show off were the excellent accommodations, centralized location, and the great banquet, complete with a top notch magician. The show included Fred Weinberg getting hypnotized… ask him to tell you about it!! In 1972, the Errorama show moved to San Diego, CA, and was sponsored by the local error club, SDEC, San Diego Error Club, with Jim Heine and Dow Rice heading up the show. This was the last Errorama to be held until 1980. An attempt was made to move the show to the southern states, and try to attach it to the ANA. The gas crisis and the general economy forced the idea to be abandoned. In 1980, “Lonesome John” Devine made an offer the error collecting community could not refuse. To put on five consecutive error coin shows… Errorama was born again. The first two shows were held in Thousand Oaks, CA, followed in 1982 in Los Angeles, CA, at the Airport-Marriott. This was the first year that two national error clubs joined together to participate in the show. CONE and NECA had come together for this single event. I personally feel that this is the most significant reason for getting the two clubs together. Many of the members had never talked or met one another, but we sure had a great time at this show. In 1983, the show moved back to San Diego, CA. The primary reason was that ANA was to be held there, and the feeling was that a show, the weekend before the ANA would be a large drawing item. The show was chaired by Rick Martinez. Unfortunately, this was probably the worst EAR to date. Too many shows too close together, and not enough error coin dealers. Where “Lonesome John” was successful with his approach for the last three Erroramas to have a mix of straight coin dealers along with the error specialists, Rick returned to the “all error” dealers format, and the show was a bust. Again, many of the national collectors of both clubs complained about the Erroramas being dominated by the west coast. Finally someone on the east coast came up with a viable plan. Bob Larkin, Rich Schemmer, and Jim Lafferty, to name a few, all got together, and for the first time, the error show headed east. Many of the west coast error dealers had pledged their support by planning to come to the show. Needless to say, the show was a big success. So much so, that the EAR returned for three years to Cherry Hill, NJ, where the show was tied to the Garden State Coin Show. The Erroramas are the most important function any of the error clubs put on to bring our specialized hobby to the general public. The Erroramas have been so good, that interest is high, and many other areas want to hold the annual show. In 1987 the show moves to Milwaukee, WI, and yes, once again, after a four year absence, back to California in 1988. At this writing, the show may be held in one of two locations, Anaheim, where Disneyland is located, or San Francisco, where the first northern California national show may happen. Unfortunately, in the early 70’s, several errorists got involved in some questionable coin related activities, including the manufacture of “fabricated” errors. This was a major blow to the hobby, and it took years for the clubs and the error collecting community to rebound. Most likely, the death of the local clubs in southern California was related to the sentencing and conviction of the errorists. None of these individuals are active in the hobby today, but every so often, some of their manufactured material shows up. Early in 1983 CONE and NECA merged to become CONECA, a name picked by the Interim Board combining the two clubs’ names. For the previous few years, with more and more of the two clubs talking to one another, peace and tranquility seemed to be returning. Many had joined both clubs, and it seemed only natural to join together. Some of the reasons to bring the two together stemmed from a pooled group of officers… not too many people seemed to want to run for office. The other primary reason was that of saving money by only publishing one monthly bulletin. CONE had also obtained tax free status, which was felt to be of benefit to the hobby. The problem was that CONE would have to give up its tax free status… enter The Error Coin Museum. TECM, the brain child of Lonesome John”, offered CONE and NECA to obtain tax free status by joining hands under the umbrella of TECM. TECM would channel funds to CONECA and allow it to function as a separate club, as long as the actions were in the best interests of the hobby. Many felt the merger was questionable, especially where the club would be governed by the head organization, The Error Coin Museum. There weren’t too many choices. My guess is that the TECM Board sold them on joining hands. Lonesome had managed to get Fred Weinberg, Duane Spellman, Ronn Fern, and Dr. Lyndon King as the TECM Board. All were considered to be knowledgeable and of service to the error coin hobby. The vote was taken, and the merger happened. An Interim Board, made up of Board members from both clubs was elected, and served for the first year along with co-presidents, L.G. “Long Gone” Davenport (deceased)(NECA) and John Wexler (CONE). Les Burzinski was appointed as the Interim Treasurer. To set the records straight, Pete Bishal is to be given credit for first using CONECA in print. The Interim Board liked it so much, they voted it to be used until an “official” name was decided upon. The Interim Board was responsible for hammering out a Constitution and By Laws, developing the new dues structure, and providing the club members with its new publication, the Errorscope/gram. If you look closely, you’ll see Errorscope and Errorgram combined. Over the next few months, a contest was held to pick the “official” club name, slogan, and the publication. Little did we know of the problems that would be uncovered. At the 1984 Errorama, the first on the east coast, the newly elected club president, Paul Munson (deceased), welcomed all to the new “official” Organization of Error Collectors (ONEC), the name picked by vote of the Board to be ours. Wrong! The audience, made up of many of the club’s members, had apparently become quite comfortable with CONECA, and didn’t want the club name to be changed. It seemed as though the Interim Board has picked the right name as far as those present were concerned. It was a pretty brave thing to do, but where the Board picked the name (and has the power to do so), we quickly voted to change the name back. The ONEC Errorscope appeared only once. The official Errorama issue in June/July, 1984… it’s sure to become a Collector’s Edition. 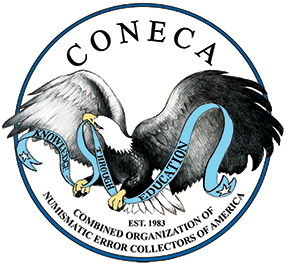 ONEC became once again CONECA, the Combined Organization of Numismatic Error Collector’s of America. Jim Johnson made the motion at the 1984 Board meeting to adopt our present club name. Lonesome John made a motion to the CONECA Board for separation from The Error Coin Museum. CONECA agreed, and once again, the club is functioning on its own. Without Lonesome’s original offer to allow the clubs to merge under TECM, the club would probably not exist today. Many of the best of CONE and NECA are found thriving in CONECA today. “Winner’s Windfall,” Clubs-Within-A-Club, Youth Club, Library, Authentication Service, and more are all part of the monthly activities found throughout the pages of the CONECA Errorscope. Auctions run, back issues are available, and more is being planned as time goes by. The club needs new blood, and many people like Ken Potter, Publicity; J.T. Stanton, Handbook co-author, editor; and Brad Miller, State Representative Chairman, are active helping promote the error coin hobby today. CONECA’s future is up to you. Many have seen publications warn of getting involved with a dying club that is being run by inexperienced people. I challenge you to find a more dedicated, knowledgeable group of people in any hobby today. The error coin hobby is growing. Many new collectors are joining our ranks. Unlike what you may read elsewhere, our club is not made up of “fast buck” artists. You will not find a group of people anywhere willing to spend the time to educate, teach and share with you the knowledge each of us have about the minting process and how errors happen, than you will in CONECA. Get involved and spread the word. 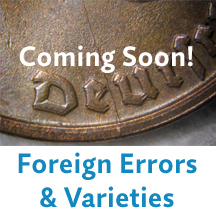 Error collecting is fun, and CONECA is the best you can find in a specialized coin club!